SCALA, a SANS Digital product, has once again redefined how we store and protect data. A recent deployment of a 7.5 Petabyte SCALA system has successfully reached an outstanding average performance exceeding 150 GB/s in a single namespace. Specifically designed for data & metadata intensive workloads, this new achievement is a direct result of the distributed/parallel file systems provided by SCALAfs and ScalaManager software combined with SANS Digital's high-end data storage servers. The end result is a scale-out system that offers low-latency with incredible performance that is optimized for both large files (>10GB) and small files (KB-sized). High performance: Increase the total system bandwidth and performance as you increase your storage. 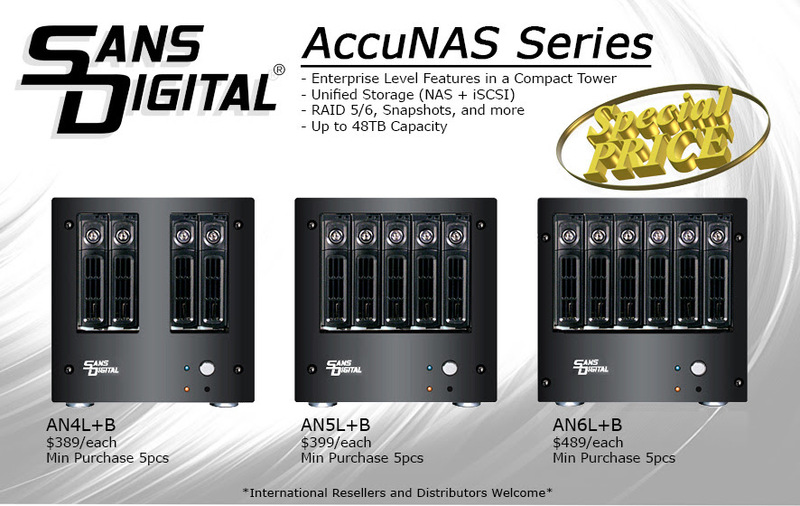 A 2PB rack of standard servers with SATA disks and dual 10GbE can deliver 18GB/s throughput. Proven proprietary file system: Eliminate performance bottlenecks without the use of traditional SAN controllers or NAS gateways. 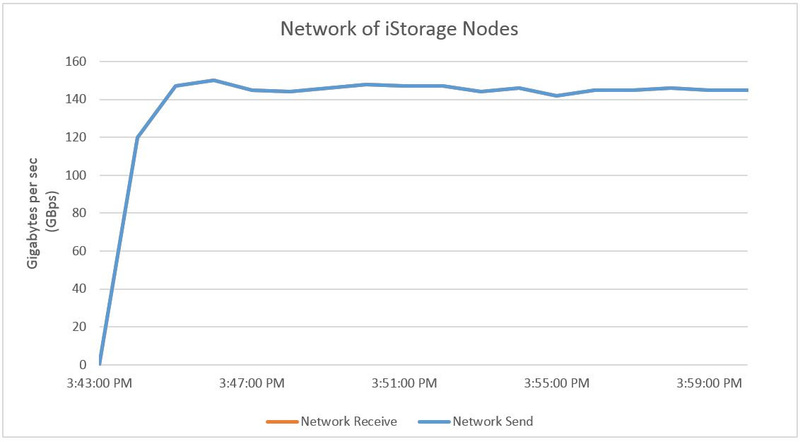 Easy scalability: from 3 nodes of 48TB/ea to 300PB in a single volume. Self-monitoring mechanism: Proactively single out inactive hardware to provide high data availability. 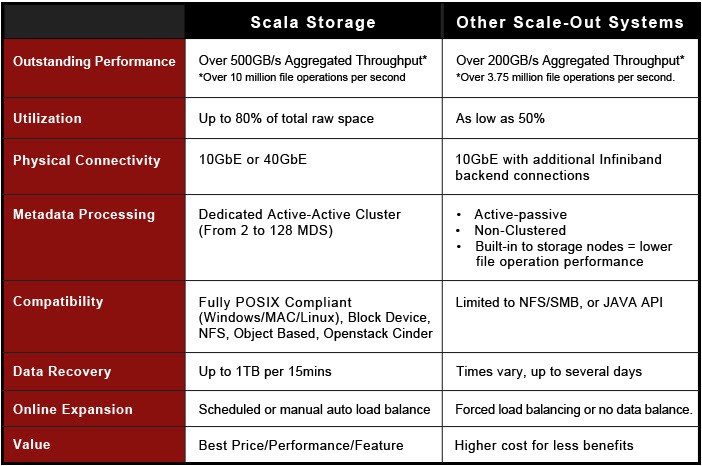 SCALA is a truly unique storage solution that has successfully delivered across a variety of industries. SCALA is scalable from hundreds of terabytes to multiple petabytes while still providing a predictable linear performance increase and high availability storage structure. 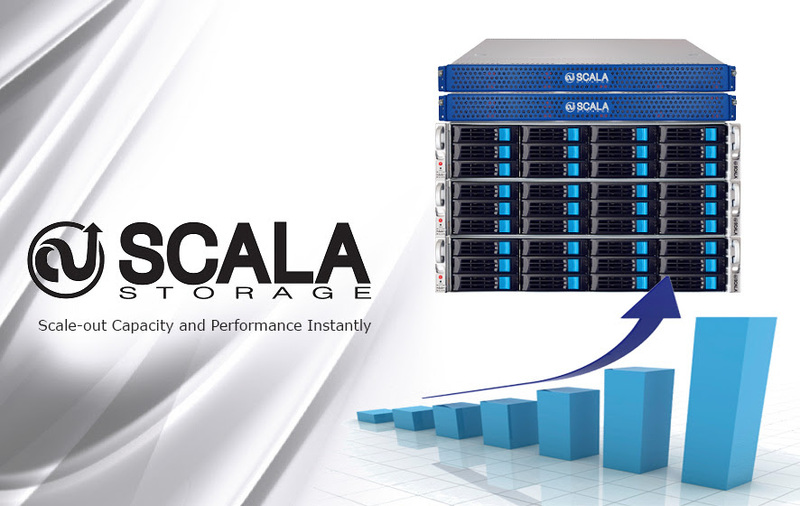 SCALA delivers extreme capacity and performance and significantly reduces an organization's capital expense, operational expense and total cost of ownership. Contact us now to schedule a web demo or a price quotation.